Last year I had the opportunity to go to Minnesota. What I didn’t know before booking my trip was that the Minnesota State Fair was going on, so when I got home I was kind of bummed to find I’d missed one of the biggest and longest running fairs in the country. Luckily, I got to experience it vicariously through a few readers who attend every year. One person was Gloria Rice, who also happens to enter the baked goods contests and almost always takes home a prize. Last year these brownies won third place. Gloria shared the recipe with me and I tried it since she was so nice to do so, but the truth was that I didn’t like the idea of bananas clogging up the chocolate flavor of my brownies. In the end, it was a good thing I tried the recipe. 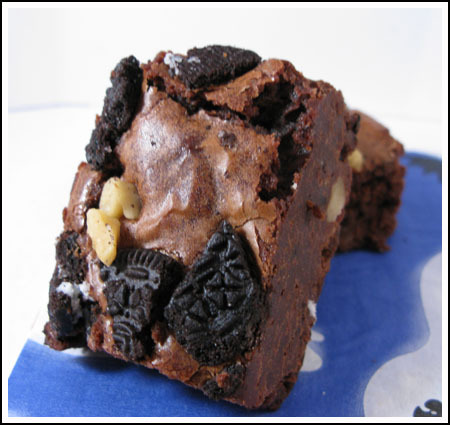 The banana flavor melded perfectly with the chocolate, it wasn’t subtle nor was it overwhelming, and I really liked the soft texture it added to the brownies. I made that recipe again and again and even did some variations, like adding Oreos. If you haven’t tried the banana brownie recipe, here it is again. By the way, the fair is in full swing right now so I checked in with Gloria to see if she’d won anything. She did! This year her maple pecan bread won a blue ribbon, her strawberry bread won second. Preheat oven to 325 degrees F. Spray cooking spray on bottom only of an 8 inch metal pan. Gloria noted that for the fair, she used non-stick foil to line the pan. Melt butter in a saucepan over medium low heat, then reduce heat to low and add 5 oz and 1 oz of chocolates. Cook and stir over low until smooth. Cool 5 minutes. Yield: Obviously, this makes 1 8 inch pan. How many brownies you get is up to you. I cut mine into 9 giant squares, but if you chill the brownies before slicing, you should be able to cut the brownies as small as you’d like. You might even want to try cutting 36 squares and serving them in mini cupcake holders. Ann, Gloria just started a blog of her own. Here’s the URL. She just started it this month. 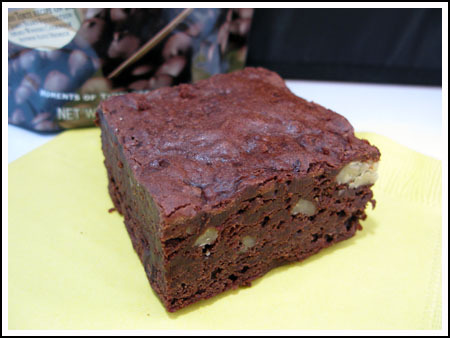 I will have to try this brownie since brownies are my favorite bar (with this chocolate revel bar I just ate at a possible close second). Natalie, my bananas always ripen pretty quickly because nobody eats them fast enough, but I wouldn’t say my bananas are really ripe. They’re just a little brown. I think you’d be safe either way. I’m assuming the banana needs to be really ripe for these, right? I spent all day at the MN State Fair on Saturday and am going back on Friday – it is my favorite time of the year!! I’ll have to go back and look at Gloria’s winning breads. The strawberry one sounds delicious. These sound excellent! I love the idea of banana in brownies! We’re going to the MN State Fair on Wednesday!! We have tickets to see Weird Al! i’ve never thought to make banana brownies. sounds great! These brownies look wonderful. I love chocolate and banana together. Oh and the Oreos! Love those too. I made Gloria’s banana brownies last year when you posted about them, too and they were fantastic! Not overwhelmingly banana, but gave a great texture to the brownies. Loved them. Congratulations to Gloria on her wins this year as well as for this recipe from last year!! I admire people who enter contests in the fields of expertise that they love. I will definitely try these some day. I think they would go over well at my house. Without the recommendation I probably wouldn’t have given them a second thought- I love bananas and I love brownies but I’m not sure about the combo. This is going on my list though! The oreos look yummy in them! I remember making these when you first posted the recipe, and they were wonderful. Now I will have to try them with the oreo cookies. What a great idea! I agree with you Anna, my initial thought was “I don’t want banana flavor interfering with my chocolate brownies.” That this actually works and that you’ve made it repeatedly says a lot. I makes me sort of want to try this….